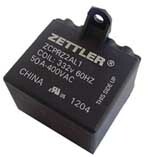 Motor Start Potential Relays | American Zettler, Inc.
American ZETTLER’s ZCPR Series potential relays offer control solutions for compressor motors. A wide selection of configurations are available with various terminal and mounting combinations. These relays assist in the control of air conditioning, heating or refrigeration system compressor motors which utilize start capacitors.